I had really high hopes for Wet n Wild Bee-U-Tiful. I thought it could be the yellow polish that would be my yellow polish. It's a cooler yellow, a little dusty, a little muted. I really like this shade in the bottle, but it just doesn't work with my skin tone. 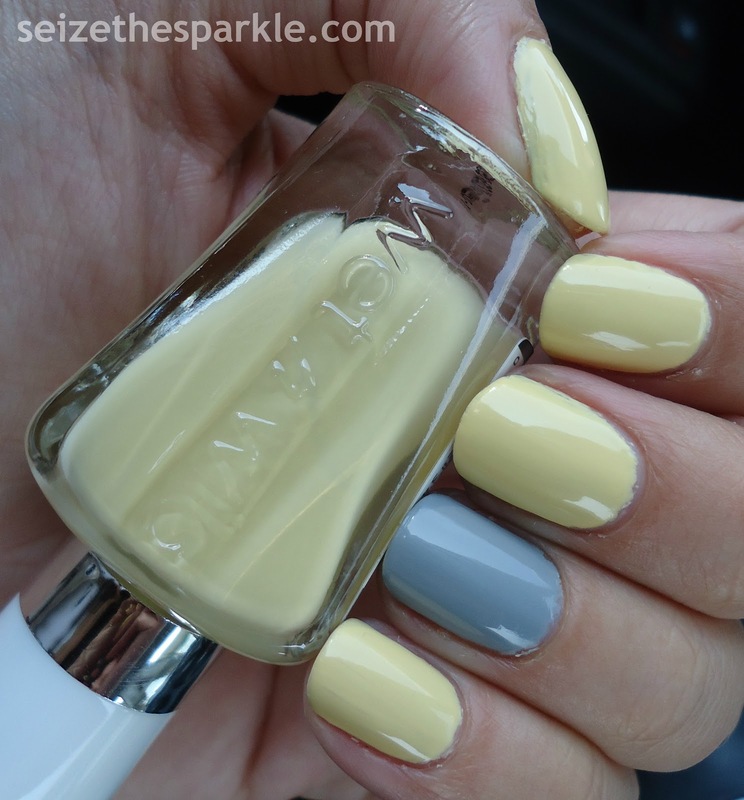 I paired it with Cool Gray for an accent mani, because I promised I would try and use 2 polishes in each challenge mani, and because I adore gray and yellow together! Application with Bee-U-Tiful was interesting. I had a lot of visible streaking after three coats, so I panicked and added a mattefying top coat in an effort to smooth things out. Then I went back with a thick coat of Bee-U-Tiful, added clear coat, and finished off my yellow nails with Seche Vite. I also ended up doing the same thing with Cool Gray on my accent nails because the ridges on my nails were super visible last night. I'm not sure what that was about, but I added Mattely in Love, another coat of Cool Gray, a coat of clear, and sealed everything off with Seche Vite. When everything was said and done, there were still a few patchy areas visible when I went to sleep. Everything leveled out, and now that I think about it, it might have done that without the help of Mattely in Love. I really didn't feel like taking that risk, and I've been wanting to try the matte top coat hack for a while, now. It definitely worked and I'll have to remember that in the future when I'm dealing with patchier polish! The more you know, right?